Touring Egypt 30: By the time Thursday evening rolls around each week, I am usually feeling pretty tired. I look forward to bed time. Tonight, this image just feels right. Parrotfish sleep at night. Swimmers, snorkelers, and divers are familiar with the familiar sight of these brightly colored fish buzzing around the reef all day. They are plentiful in tropical waters all over the world (and in most city aquariums). It can be downright creepy to come across one during a night dive, motionless and nonresponsive, propped up in a random spot. 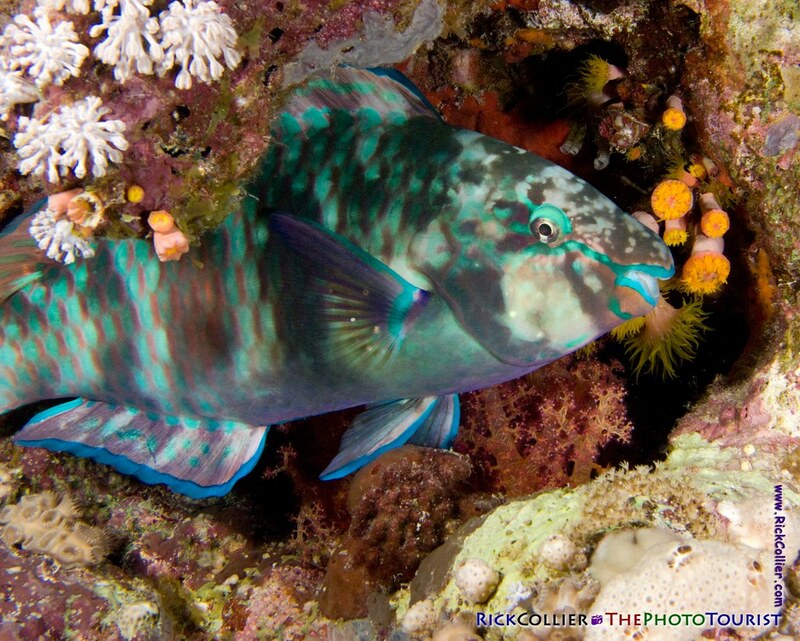 At night parrotfish wedge themselves into a hole or overhang and go to sleep. Sometimes, they pick a space between two plants or sponges or even an exposed spot under an overhanging sponge where a constant current will hold the sleeping fish in place. The parrotfish will wake with a start if touched or disturbed, but otherwise they sleep quite soundly and can be approached pretty closely for a view one could never get when the fish is active during the day. Their eyes don’t close, of course, but they are nonetheless sound asleep. Sort of like me at the end of a long work day. This entry was posted on Thursday, October 8th, 2009 at 19:39 PM. It is filed under thePhotoTourist, Underwater and tagged with coral, destination, dive, diving, Egypt, fish, night, night dive, Paradise, parrot fish, parrotfish, Red Sea, reef, scuba, scuba diving, Sharm, Sharm el-Sheikh, Underwater. You can follow any responses to this entry through the RSS 2.0 feed.